Happy Monday! And to those in the U.S., Happy Labor Day!! Hope you all are enjoying your extended weekend!! 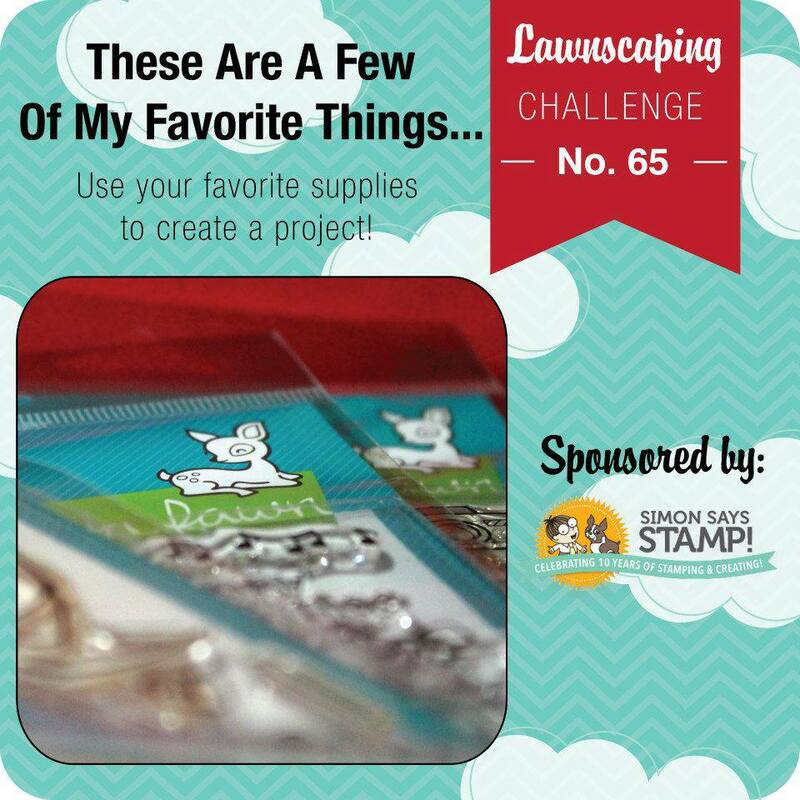 We are back once again for a new Lawnscaping Challenge!! For this challenge - we want you to get out your favorite supplies to make a project - whether its pattern paper, markers, stamps ( of course Lawn Fawn) and any supplies you like to use!! Bust 'em out and get crafty and join us for this new challenge! For my card - my favorite things to use and to feature is color, texture, and dimension - and I knew that one of my newest sets that I adore from Lawn Fawn would fit right in with all of these things. So - my favorite supplies to achieve this......my Copics, Distress Inks, different textured card stocks, and my foam adhesive. I started out by creating my sky, and I stamped out my clouds in Versa Mark onto my white card base and heated embossed with white embossing power, and then I inked it up with Distress Ink - I used both Tumbled Glass and Salty Ocean. 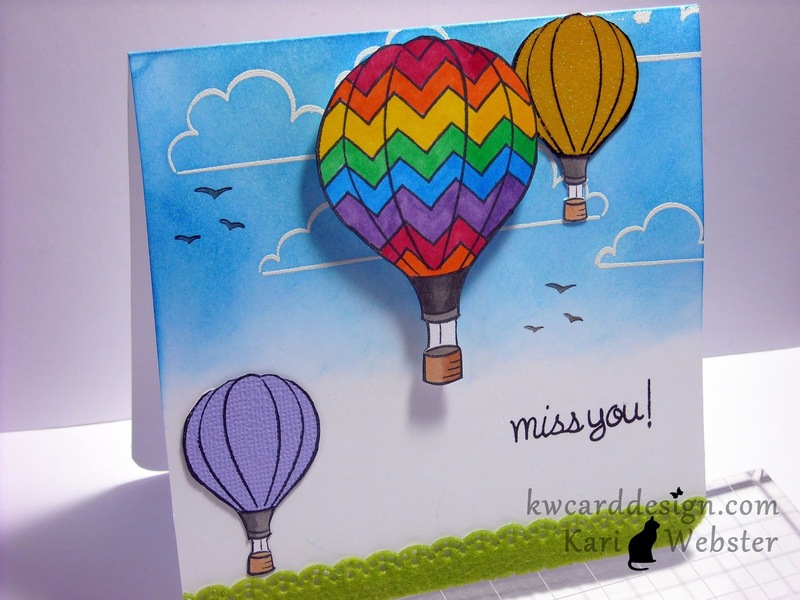 Then, I took the set "Blue Skies" and stamped the biggest balloon onto a scrap of white card stock, and then took a Chevron pattern stamp I had and added the chevrons for something different on the balloon. I picked out some Copics in a rainbow colors and colored in my balloon and then I fussy cut the balloon out. In this case, since I added the chevron pattern, I really couldn't use my die since it leaves a white border. I then stamped the other small balloon onto some glittered and textured card stock from DCWV, and also cut them out. I had some green ribbon that I thought could represent "grass" and adhered it to the bottom of my card base. I adhered the to smaller balloons straight down onto the card, and the bigger one up on foam adhesive to give that dimension that I love! Really makes the balloon jump off the card! I added my greeting "Miss You" from "So Much To Say" and then, for a final touch, I had a cluster bird image from a SU! set that I thought would go great!! Looking forward to seeing all the entries!! such a wonderful scene here!! love those hot air balloons!! they're perfectly colorful and happy!!! so fun! Oooohhhh so pretty!!! I LOOOVE your colorful scene!